Home > Show Judges > What Training Do Dog Show Judges Have? Years ago, breed experts were invited to judge because after many years in the breed, they were considered to know a ‘good dog.’ They would have bred good dogs and could show a dog well. Quite often these people were said to have ‘an eye for a good dog.’ Chances are they wouldn’t have been able to write a report (critique) as to why a dog was superior to its fellow ring mates. Stand ringside with one of these old timers and they could pick an excellent example of the breed by its movement before they had even laid one hand on the dog. If a dog can move well usually it is constructed correctly and these long gone breed enthusiasts could spot this with ease. Sadly as the years have passed, too many so called ‘experts’ have arrived on the show scene. Like most careers and sports a standard of training and expertise had to be devised to ensure that those wanting to judge dogs knew what was expected of them and to show that they were qualified to carry out the honour of judging a dog. 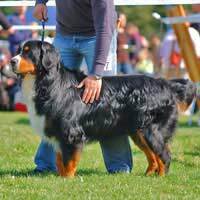 In the past, breed clubs have organised canine seminars and educational events where interested parties could be educated in the history, conformation, breeding and health aspects of the breed they represented. These were always interesting events and a chance to socialise with fellow lovers of a breed. Since the Kennel Club decided that all judges had to be examined and deemed good enough to lay their hands on a dog, the majority of clubs and societies now only have the time and resources to organise official judges training seminars. The days of the general interest seminars for people wanting to know about the breed have long gone. Stringent rules have been set as to who can ‘judge a judge’ and pass him or her so that they can progress up the ladder from judging small Open Shows to the ultimate accolade of being a Championship Show judge. Prospective judges have to have served time as a ring steward, judged a set number of dogs plus classes and shows. They also have to have owned and bred a certain number of dogs that won their way into the Kennel Club Stud Book before they can be invited to judge at Championship level and award the Challenge Certificate that ultimately makes a dog a champion in its breed. The Kennel Club has a basic template of the requirements of a judge but each breed club and breed council can add their own interpretation to this. The numbers of registered dogs and those that actively show in each breed determines how many dogs, classes and shows have to have been judged before a person can progress up the judging list. All breed clubs hold a judging list. The breeds with a Breed Council will have joined together to produce one unified list for all judges of the breed. The list starts at the bottom with the ‘C’ list, which is for those interested in judging the breed but may not as yet have been invited to judge. The ‘B’ list will be for those who are ready to judge at Open show level. Further up the list will be those that have passed all the required examinations and assessments and are awaiting their first Championship appointment. Then there is the ultimate list, which shows all the names of people who have judged the breed at Championship Shows. The list is split into two sections, one for breed enthusiasts/experts and another for ‘all rounders’. An all rounder cannot judge other breeds until he or she is passed to awards CC’c in his own breed. Many Breed Clubs hold a roll of honour that shows the names of top judges who no longer wish to judge because of age or illness but have the right and honour to be present on the judging list. Each year the Breed Clubs and Councils have to supply the Kennel Club with a copy of the judging list along with their annual returns. A judge is expected to have kept a detailed list of his appointments along with entries and classes judged. This can be checked for accuracy and the Kennel Club and Breed Clubs frown on anyone making false claims. Sadly there will always be the odd pretentious ‘newbie’ who obtains appointments, curries favour and flies through their training. They will be giving tickets (CC’s) while other more deserving people are patiently waiting to be invited to judge. They will have the funds to be able to buy top bred puppies from the best kennels thereby winning the desired stud book entries while others work hard learning their craft and steadily climbing higher in the breed ranking. This is the way of the world and no rules set by the Kennel Club will stop them. Ultimately it will be the exhibitors that decide with their entries, a good judge attracts good entries a bad judge loses entries and consequently will not be invited to judge again.